Welcome to The Maple Money Show, the podcast that helps Canadians improve their personal finances to create lasting financial freedom. I’m your host, Tom Drake, the founder of Maple Money, where I’ve been writing about all things related to personal finance since 2009. Ever thought about buying a second house or condo, so you can rent it out? My guest this week is Meghan Chomut, a Certified Financial Planner who specializes in helping people who want to add an income property to their investment portfolio. 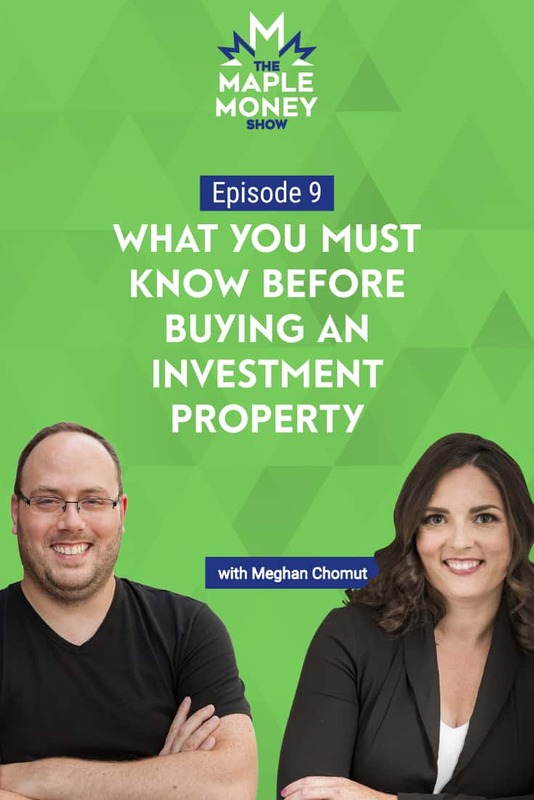 Meghan and I discuss some of the differences between investing in a Real Estate Investment Trust (REIT) vs. owning an income property. Meghan explains that when buying an income property, you are actually buying a business. Meghan draws on her own experience as a real estate investor and points out that owning an income property isn’t quite how it looks on TV. We discuss the many expenses you need to be prepared for, and Meghan shares several tips on finding a great tenant. Communication is key! If you’re considering real estate investing, it’s an episode you don’t want to miss. Our sponsor this week is Borrowell. They have a new and approved recommendation engine, where you can find personalized product recommendations from credit cards, to mortgages and loans from trusted partners, tailored just for you. Head over to Borrowell to get your free credit score, and more. Investing in rental properties vs. REIT’s. The tax advantages of owning a rental property. When you buy an income property, you are buying a business. Understanding the hidden expenses of owning a rental property. Why understanding vacancy is so important. Why you don’t want to feel rushed when looking for a tenant. Tips on finding a great tenant for your rental property. The importance of good communication between you and your tenant. Tom: Meghan thanks for being on the Maple Money show. Meghan: Thank you so much, Tom, for having me. I’m really excited to be here. Tom: I’m glad to have you on here. For those that don’t know, you are a CFP that works at Property Owners. I wanted to have you on to kind of walk us through that because I don’t know a lot about this. Can you tell us a bit about how rental properties are part of your portfolio? Meghan: Personally, they’re part of my portfolio in that they give my family some cash flow. The intention of the cash flow was originally supposed to be long-term in terms of providing us with long-term retirement savings. I live in northern Canada so we wanted to fund our snowbird lifestyle, hopefully. That was the intention of it being held in our portfolio. The intention was not to think about it in terms of selling or benefiting from that for the next 20 years or so. But things change, just like everything. When we bought it, we were young. We were just starting our family and then our priorities kind of changed a little bit. A couple of years ago we started using some of the cash flow to supplement our income because I started my own business. We had to think, is it as a component of our portfolio that’s still long-term? And, would it benefit to sell it and invest the proceeds differently? When I put on my CFP hat I found that the numbers made sense to keep it. Sometimes your emotions get the best of you. And we know it was originally supposed to be there long-term. It’s pivoted momentarily. We’re slowly making it more of a long-term portion of our portfolio now because owning an income property is not like they make it look like on TV where you get the keys, it’s exciting—you get to decorate or paint the walls or renovate as a couple. It’s all fun. But sometimes having that CFP hat switch on every once in a while is a big benefit because when you get the phone call at midnight that the basement of your rental property is flooding, that’s your responsibility. Tom: That’s what I was thinking when you said it’s not like the dream on TV. I was a renter once and we had issues—not flooding but things like the washer being broken that needed fixed right away. The guy we were renting off at the time had to come at different hours, crazy hours, to deal with that. And that leads me to where I wanted to go next. Personally, any sort of real estate investing I do is through REITs. Can you compare the difference between investing in a REIT and just investing in actual property? You kind of touched on the downside in recent times but I assume there’s extra money to be made there? Meghan: Well—and it’s funny too because I mentioned the thing of flooding but, when you own the property, you are essentially buying a business. It’s the same industry, a REIT and an income property, in saying it is real estate. But when you buy a building, you’re actually taking care of all the bookkeeping, the customer service, the maintenance man, the landscaper—everything. And, like you mentioned, the washing machine has to be fixed, or like I said about the flooding, or little life things happening, like they lost their keys. The things we all do take time and energy. It’s not a lot of money to replace a set of keys but it’s like having a part time job when you this real estate. Whereas a REIT is something you buy, you hold it, you watch the price fluctuate and that’s pretty much where your responsibility ends. Meghan: You don’t have to file taxes. You don’t have to track the expenses. You don’t have to chase tenants when their check bounces or when they forget to transfer you the rent. It kind of depends on what your comfort level is. If you have always had a little bit of an entrepreneurial desire then maybe owning the actual property would be a good experience. But if you don’t have any interest in managing people—because that’s what it is. It’s a lot of customer service, bookkeeping and accounting, that side of things. In that case, owning the property wouldn’t make sense but if you’re interested in real estate then, absolutely, look into REITs. Tom: Okay. We started off making it sound like there are a lot of downsides. What are the upsides to this? I assume there is a better potential financial upside like with the REITs. Not only are you paying just the normal expense ratios if you’re doing an ETF on them or anything like that but the REIT company itself is also taking more than their fair share as well, I’m sure. Are there are a lot more financial upsides to owning your own place? Meghan: I don’t know if I would really compare them like apples to apples just because of the nature of the investment themselves, especially because you can hold REITs in various different accounts in terms of sheltering them from certain things. But there are benefits to owning income properties in that you essentially own property you could use for maybe your own personal use later on in life, or as your legacy for your children or other dependents. And, you have other people essentially paying off the property for you in exchange for you buying smart and investing the time and the knowledge into everything that comes into owning the property. But in terms of benefits, we’ve experienced a lot of great benefits in that we’ve had great tenants. Meghan: I’m knocking on wood here. We’ve met some amazing people that never would have entered our lives otherwise. We’ve also gotten the experience to be entrepreneurs together, my husband and I and learning all about that kind of dynamic. I’m more of the tenant finder and ad-maker and he is the maintenance man. When we go and look at a potential income property, he will come with me or I will make notes when I go and look at it. If the numbers make sense, I’m all in. Whereas he will say, “That bathroom will take years off my life. I’m not doing it. No!” So, just those kinds of things are great benefits. They’re like life benefits instead of just monetary. And then the flexibility we’ve had. Like I said, we originally bought the property for funding our retirement. When we had our third child, one of the options I wanted us to consider was me not going back to work full-time in terms of the numbers making sense. It made sense for us to either postpone that retirement or make some wiggle room in terms of our finances. And that property helped us get through that runway of baby-turning-one. Because we’re in Canada, baby-turning-one means going back to work. Maternity benefits are over, so what’s my next step? It allowed me to have that breathing room where I didn’t have to stress about how much money we had coming in the family house. Tom: One of the other benefits I was thinking of is that there must be some tax advantages to this. Can you shed some light on that? Meghan: In terms of tax benefits, it’s almost like you’re two entities. For example, let’s say my husband and I make income—normal T4, employment income or even self-employed income. That’s one entity. The other entity is the rental property. So the only tax benefit there is on the rental property. Whatever you’re making in rent, you’re able to deduct the expenses against which you’re making in rent. So you could essentially make that negative. You could say, “This property costs our family more to run it than we make from it which reduces our income and our taxable amount.” However, if you keep doing that year, after year, after year, the government will say, “Wait a minute. Why are you keeping this rental property if year, after year, after year, you’re taking a huge hit? This doesn’t make any sense.” So you have to strike that balance of claiming expenses that are appropriate. There’s also an expense called depreciation which essentially—even without a negative cash flow, will allow you to make your taxes look like that property had a negative. It will bring it to zero like you didn’t make any money on it. Other than that deprecation, that’s really your only other option to reduce it and not get a red flag on you. Tom: If there is a second mortgage on this, is that considered an investment loan that is tax deductible? Meghan: You’re able to deduct the interest. Meghan: And, let’s say you bought a property and it required a little bit of work to get it livable. Or, maybe you didn’t have the cash to replace a furnace or do some sort of landscaping thing and had to take out either a line of credit or maybe put it on a credit card—that interest is also deductible. Meghan: It’s very similar to that. It’s called the T-3776. Meghan: It’s very similar, very clear. They are very clear on what qualifies as income. They’re also very clear if you live on the property, what percentage of the property is it? Meghan: Then they list out the expenses that you can claim. So, if you have income property taxes, they’re really clear on what they will allow as an expense. But they pretty much allow everything. Tom: If someone decides this is right for them, how did they get started? Tom: To sell that day, yeah. Meghan: You cannot sell it that day. And that’s somebody’s home now so it’s a little bit more complicated. There are a lot of expenses that people kind of forget to account for when they try to find a profitable property. One of the things a lot of people forget to include is vacancy. when I say it’s like can your personal finances hold the debt. Can you afford to do the down payment required let’s say for example that property has to sit vacant for three months. Can your family sustain that. Is that something that’s going to cause you a lot of stress or financial turbulence. Because if it is maybe just wait. Keep looking keep doing analysis and keep trying to find that perfect property because owning the property. Like I said it’s like a part time job. That’s stressful enough as you start to get comfortable and start to learn the ropes. The last thing you want is the financial stress as well. Tom: The idea of vacancy is one of the scarier thoughts for me. When we lived in a townhouse we owned our townhouse but the lady beside us was renting. She rented that place for 30 years and more beyond that by the time we had moved. What a perfect tenant. They’re pretty much there your entire mortgage length. But yeah, the idea of going a few months without a tenant would kind of drive me crazy I think compared to having someone there to pay for it. Meghan: It’s one of those things that, when you are in that vacancy period you don’t want to feel rushed to find a tenant because it’s better to find the perfect tenant. I want that old lady who’s going to be there for 30 years as opposed to feeling heavy and rushed in picking somebody who’s not going to pay or who’s only going to be there for six months. You really want to be clear-headed when you’re doing your screening because you don’t want the added responsibility of going through the process again in addition to maybe evicting somebody. Tom: Do you have a couple tips on how to find a good tenant? Because it seems like that seems to be one of the bigger risks out there assuming you’ve bought a place at a decent price. The only other thing after that is really keeping tenants. How do you find a good one compared to all the other options out there? Meghan: I have been super lucky. I think it’s a combination of doing your due diligence but also trusting your gut. What we’ve done in the past is, I’m the only one who screens the tenants. I’m the only one who books the appointments, meets with them, and shows the apartment. My husband has nothing to do with it. I think it helps too because we are from a small town and he is more social. He knows a lot more people and a lot more people know him so renting to friends and family really can—Not even friends and family but just people that know you through connections, sometimes can backfire. I think having a neutral party to do your screening is helpful. One thing that I like to do is Google them. Put your listing out there, see who responses and just type their names in see what comes up. Most likely they have social media and their social media pictures are an accurate reflection of the kind of things that they like to do. Tom: That’s why people need to watch what they put on social media. Meghan: Yeah, so what I do is book all my viewings on the same day. I try to so that they’re 15 minutes apart, one right after another. And, when I’m meeting with the people I have done my background checks in terms Google and the internet then I just treat them like people. I don’t treat them—when they come to see the place I don’t have any real ulterior motive. I’m just one person to another, could we be friends? Do I feel like the communication we had over email or text messaging (however they booked that appointment) felt comfortable to me? Because that’s going to be the biggest thing—the communication between myself and the tenant. If they took days to respond to me that might not be the best tenant. And then when they come and I’m meeting them and just getting to know them showing them the place, I can just see if they are respectful of the space if they take their shoes off. Did they throw their cigarette on the ground when they walked in? Just little things. I think trusting your gut too. I know a lot of people say it’s better to separate business from those types of decisions but I feel that trusting your gut is important because you’re in this relationship with this person, hopefully, for a long time. You need to like them and they need to like you. Tom: Yes, that’s a great point. It seems that if you can find the right person it would take a lot of fear out of this. Can you let everyone know where they can find you? Meghan: Yes, I have a website. My website is meganchomut.com. I also have a Facebook page. You can just search me, Meghan Chomut CFP and my page will show up. I post a lot of resources about what numbers to look at. I think the important thing (when you’re first getting started) is to talk to other people who are about 10 steps ahead of you. I always compare it to if you’re having trouble getting your baby to sleep, you’re going to ask another parent whose child is maybe a year older than yours. Meghan: I don’t want advice about putting my baby to sleep from someone who never had kids or tells me how they get their dog to sleep for the night. And the same thing goes for rental properties. If you’re interested in it, don’t ask your aunt. Don’t ask your neighbor down the street who has no experience in real estate. Find people who have a property and are about 10 steps ahead of you. Tom: For sure. That’s good business advice in general. I’ve always found if you can talk to someone that’s just a little bit ahead of you then that’s normally the best place to get information. So thanks for coming on the show. Meghan: Thanks so much for having me. Thank you for listening, and thanks again to Megan for her insight on investing in income properties. You can find notes for this episode at maplemoney.com/meghanchomut. If you like the show, please share it with a friend. Even more awesome, head over to maplemoney.com/show and find your favorite episode. Share that on Facebook or Twitter and let everyone know.